Given that it’s the biggest, hottest property in the movie world, I’m surprised it’s taken this long for a high-end Marvel game that isn’t a fighting game to reach us. We’ve had movie tie-ins ranging from stinker to solid over the years, but Marvel’s Spider-Man for PS4 feels like the first big-budget, top-tier Marvel game to release in a long time – finally there’s a superhero game to rival DC’s huge success with Batman’s Arkham-based gaming outings. That’s the big take-away from hours with Marvel’s Spider-Man, by the way: this is a game that’s on par with the Batman Arkham trilogy in terms of super-hero gaming action – and it could be argued as the most compelling display of super-heroics since the original Arkham Asylum. Spider-Man doesn’t have the sense of groundbreaking originality, but what it does have is astounding competency in almost every area it tackles. 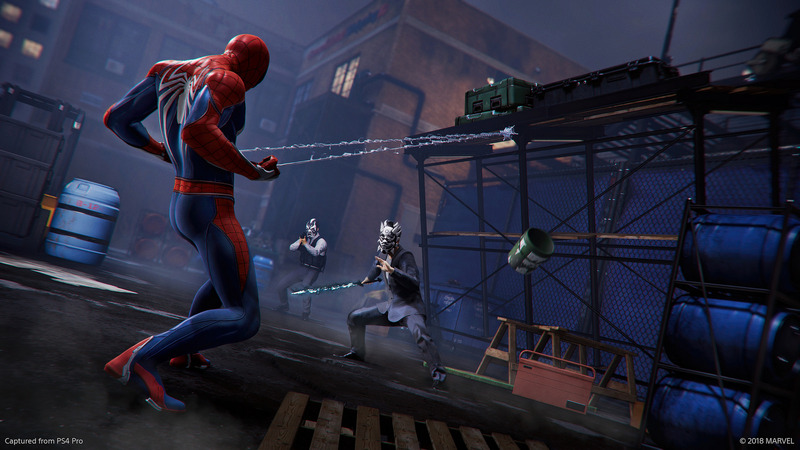 It’s clear that developer Insomniac Games worked hard to consider the game’s peers: so yes, the counter-heavy, rhythmic combat feels like Batman, but swinging through the city is clearly a mechanic dually descended from the excellent web swinging from 2004’s Spider-Man 2 game and the flowing, rapid movement found in Insomniac’s own Sunset Overdrive. 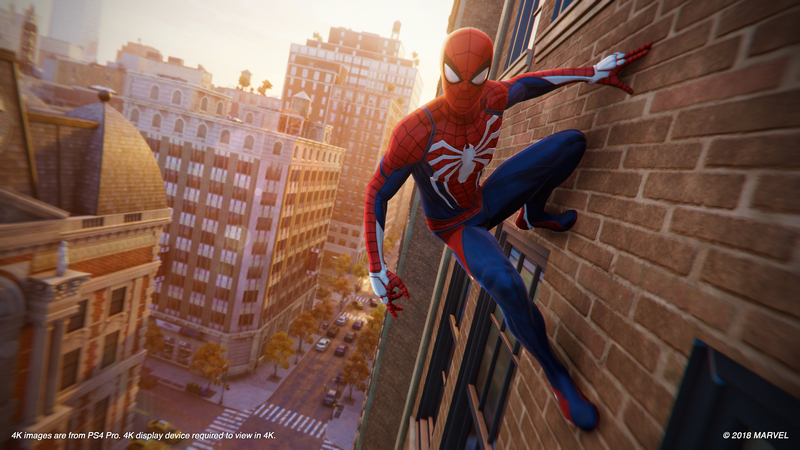 The result is a package that feels great to play, and at its best gives you enough gadgets and options at any given moment that you truly feel like Spider-Man and Peter Parker – a heroic genius, stringing together skills in a way that looks and feels good. At its best Spider-Man gives you enough gadgets and options at any given moment that you can truly feel like Spider-Man and Peter Parker – a heroic genius, stringing together skills in a way that looks and feels good. Worth a moment of praise is the game’s structure, which smartly tries to tackle one of the most difficult questions with a game like this: in an open world a hero needs criminals to fight, but too many and the world begins to feel broken and unauthentic. Spider-Man is thus narratively split into three distinct acts, and with each act the world state shifts and changes. Without getting into spoiler territory, it’s reasonable to reveal that the first act depicts a New York relatively at peace. All the major criminals are in prison, and though there’s a bit of intrigue Spider-Man is mostly dealing with day-to-day crime and quipping large. He’s having fun. In the second act things get a little more real, while the third turns the city into a hostile, dangerous environment. One ally suggests it feels like the end of the world, and though the action is restricted to Manhattan it’s to the credit of this design that as things begin to turn sour it really does feel that way. This structure also hooks up with your progression perfectly. Rather than Spider-Man’s abilities growing as he takes on a static world, skills and gadgets unlocked and upgraded are obtained almost out of a sense of necessity to survive in an increasingly challenging environment. By the time you’re maxed out towards the end of the game enemies have gone from fists and lead piping to jetpacks and experimental energy weapons that cleave your health bar like a knife through hot butter. It makes sense. These increasingly difficult encounters with normal enemies are actually generally more impressive than the mixed boss encounters – though those do improve dramatically towards the end of the game. The narrative missions are well executed, though my experience with Spider-Man’s side activities was more mixed. It’s fairly standard open-world fare, where mechanics built for story missions are redeployed throughout the world as additional distractions. Crimes crop up randomly across the map, for instance, and task you with saving people or defeating enemies. There are four flavors of enemy base, each of which requires you clear a particular area of waves of enemies to liberate it. These side missions are tied to your progression through the world states as mentioned above. As different factions of enemies emerge more bases appear to be taken down. More crimes crop up. An early, carefree mission has you chasing down lost pet pigeons – later, that same style of mission reappears – except you’re now chasing down dangerous drones. There’s a decent spread of original content here, though there’s the standard-issue level of repetition you’d expect from an open-world adventure. Alongside these more basic side activities there are a few enjoyable side quests, including one that concludes with a fight against a fan-favourite antagonist. Another mission thread teases out an appearance from another much-loved character but ultimately cops out – rather shamefully, that character’s full appearance is saved for DLC. That’s a little rough. Still, you’re well incentivized to tackle the side-missions since they unlock new suits and offer up the materials necessary to build those suits or upgrade your gadgets. The repetitive nature of some of the missions is a criticism, but a relatively minor one – especially since the basic actions of the game – the swinging and fighting – feel so good that you can happily do them for hours. The repetitive nature of some of the missions is a criticism, but a relatively minor one – especially since the basic actions of the game – the swinging and fighting – feel so good that you can happily do them for hours. My more pressing criticism of Spider-Man is actually related to the story missions, which semi-regularly pull you out of Peter Parker’s spidey-shoes in order to drop you into the role of a couple of other non-superpowered characters. I’m actually broadly okay with this as an idea, but the problem comes in the execution: each of these sequences is an instant-fail stealth sequence. These missions aren’t broken or anything, and aggressive checkpointing means you’re never catapulted too far back – I just think they’re frustrating and, well, a bit rubbish. The last couple are more fun as minor skills for these characters are introduced, but I’m still generally not a fan. These are small detractions from the main experience, but generally speaking Spider-Man is a fun, colourful and tightly-constructed game. The combat is thrilling, the story well-told and the open world a fun place to inhabit largely thanks to how fun it is to traverse with Spidey’s abilities. The game gives the world plenty of breathing room to be one of the star members of the cast before in the late-game refocusing on Peter and his super-villain rivals, that shift in focus allowing for some great two-on-one boss encounters.